Ever wonder how celebrities always seem to have such perfect teeth? In many cases, the answer is veneers. The good news is, you too can achieve a celebrity-caliber smile with veneers provided by leading dentist Dr. Leonid Levit. Dr. Leonid has enhanced the smiles of countless New Yorkers with veneers provided at his two dental practices, Levit Dental in the Brighton Beach neighborhood of Brooklyn and Kensington Dental, located in Brooklyn’s Kensington neighborhood. If you’re ready to improve your smile, call or book an appointment online with Dr. Levit today. Veneers are a popular cosmetic dental treatment used to correct and improve the appearance of your smile. Veneers are thin shells, usually made of porcelain, which cover the front of your teeth. Porcelain is used because it can be tinted to match your neighboring teeth and can be polished to shine just like a natural tooth. Veneers are customized to fit your mouth exactly and are relatively quick and simple to place in your mouth. In many cases, Dr. Levit will suggest veneers as an alternative to a crown. The placement is less invasive, and veneers produce results that are just as effective and natural looking. Veneers are usually placed over two appointments with Dr. Levit. During the first appointment, Dr. Levit examines your teeth to ensure there are no other conditions or issues that need to be corrected before placing the veneers. If you’re ready to go, Dr. Levit removes a tiny (about .55 mm) layer of tooth enamel. This makes space for the veneer to fit flush with your other teeth and gums for a natural appearance. Then, he makes a mold of your teeth which he sends to a dental lab where your veneers will be custom made to fit your teeth exactly. Before you go, he fits you with temporary veneers to protect your teeth while your permanent veneer is being made. At your second appointment, Dr. Levit fits your permanent veneer and bonds it to your teeth with a special dental cement adhesive. 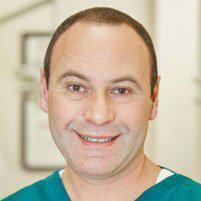 He polishes your veneers to create a natural shine and checks the fit with your other teeth and gums. He also checks to make sure that your bite is healthy and unaffected. You take care of veneers the same way you take care of your natural teeth: brush and floss daily and attend regular dental checkups. With proper care, your veneers may last a decade or more, providing you with a beautiful, bright smile.